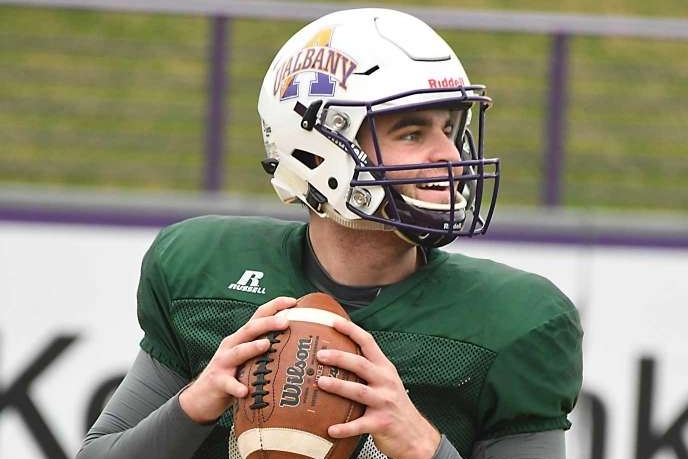 Vinny Testaverde’s son is the starting quarterback for the University at Albany. Vince Testaverde, whose Heisman-winning father played 21 seasons in the NFL for several teams, including the Jets, after starring at Sewanhaka High School, will start when the Great Danes open the season Sept. 1 at Pittsburgh, coach Greg Gattuso announced Thursday. Testaverde hasn’t appeared in a college game since 2014, when he played in one game as a true freshman for Texas Tech. He spent the 2015 and 2016 seasons at Miami, his father’s alma mater. Testaverde redshirted in 2015 and was a member of the practice squad in 2016. He transferred to Albany in the fall of 2017 but was required to sit out the season because of NCAA transfer rules. The fifth-year senior will have one year of eligibility with Albany. Testaverde played well in the spring game, completing 11 of 18 and throwing two touchdown passes. He emerged from a three-way battle for the starting job, beating out Will Brunson, who started all 11 games for Albany last season. I don't know - football's been extremely generous to me, yet somehow fate does me dirty on this one. This game is going down when I'm out of town in Chicago for work. Of all the college football games, I'd love to go to this Pitt home opener, but duty calls for some pro wrestling journalism (All In, baby) and the pigskin will do the same for Vince Testaverde and the Albany Great Danes against your Pitt Panters next Saturday. Nonetheless, the fact that I got to watch my favorite athlete, Vinny Testaverde, travel a road that very few professional athletes have traveled by playing NFL football until he was 44 years-old is something I'm extremely grateful for as a sports fan. Don't get me started on how underrated the Vin-man was (because I've been started on it many times - it really doesn't take a lot). Being 44 as a pro quarterback are goals GOATs like Tom Brady only dreams of accomplishing and Vinny did it without the aid of electrolyte pajamas and a passing-favored NFL. But this isn't about Vinny. It's about his son, Vince. It's pretty awesome that he's finally getting a shot after jumping from Texas Tech to being a back up at his pop's alma mater. The dude's been waiting for four years for his opportunity under center and now he's finally getting it against a marquee name that's had its share of Canton-landed and Canton-bound players. Pitt's trying to prove themselves with a young Kenny Pickett and an "all-eyes-on" Pat Narduzzi, but Vince has a lot to prove too. Albany's coach Greg Gattuso says Testaverde plays with an anger and is all for Vince harnessing those fiery chips on his shoulder into TD passes and Ws. As a fan of his dad, I'm all for that too. Vince is his own individual and I'm looking forward to see that go down at Heinz Field next week. Even if I can't be there. Let's go Vince. Make it happen.